One Place You Must Visit: Glenworth Valley, NSW. There are plenty of things to see and do in NSW, but there is nothing quite like this place. With it's 3,000 acres of unspoilt wilderness, located in a deep valley in the hinterland of NSW's Central Coast you often forget you are so close to the city. Im talking about Glenworth Valley. It's a must see, even if you go there to feed the horses and have a walk around. I personally have been visiting Glenworth Valley frequently for years. At one stage I was horse riding their weekly. I have since opted for quad biking instead of horse riding. There's a hell of a lot to do, and I have not gotten around to all of it yet. Im not a keen camper purely because I prefer modern comforts and not being eaten by mosquitos, although the camp grounds are large and showers and toilets are a plenty and free. You might want to get in early for a shower as hot water seems to run out quick. Canoeing, Bush Walking, Kayaking, Abseiling and their new activity Laser Skirmish. Horse Riding has been a fun activity, the staff at Glenworth Valley match you with a suitable horse based on your experience. So even if it's your first time riding your going to have fun and learn a lot. Horse riding goes for about 1.5 hours, and is done in groups, so generally there is no riding off on your own. There are 3 different tracks available, my favourite is the creek crossing where the horses walk through knee deep water. It's not that uncommon for the horses to stop and drink or play in the water, so be prepared to get a little wet. Make sure you leave your mobile phone in the car unless you want it broken or lost. There are no set tracks for each activity, so it's worth discussing with the Group Leader before departing. Helmets are essential to wear for safety reasons, and are leased out on the day. It's safe if you're sensible about it. If you're a hoon on the road you might want to either reconsider your style of riding or don't go quad biking at all. Bear in mind that the majority of people who do go quad biking are first timers or are still fairly new to the sport, and you need to consider these people. My only advice to first timers is don't get cocky after the first few laps of the track, it will only end in you damaging yourself or the bike and fee's are payable if you damage the bike. That said, Glenworth Valley cater for beginners really well. Before being allowed to depart on your quad bike all riders MUST attend some basic training that ensures you know how to steer, stop, accelerate at slow and fast speeds. You actually have to successfully complete a short track, not crashing into witches hats. It's easy and I have seen plenty a 14 year old complete this. In my case I was going too fast around a corner and took the quad bike right off the track. It's one hours drive North from the centre of Sydney. On a GPS look for Cooks Road, Glenworth Valley (do NOT input a street number) as you will end up at the other end of Glenworth Valley where you cannot enter and it's a long drive back. 2km after the Mooney Mooney Bridge take the Calga/Peats Ridge exit. The Glenworth Valley exit is 4km after the Peats Ridge exit. A great ways to get to Glenworth Valley is to rideshare using LifeSocial. 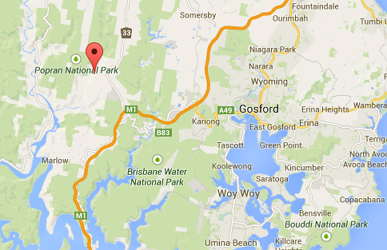 A Taxi from Gosford station will cost you around $70 return and it's just an unnecessary cost to a fun day.